One of my friends has Panasonic Lumix DMC-ZS7 digital camera to shoot videos in her spare time. She tried to import AVCHD Lite format from Lumix ZS7 in 720p to iMovie 8, and it seemed to import find. But when she starts playing the video in iMovie, the video is fast forward and the speech is in normal speed. Even she exported a project with the video, the same problem happens. Well, one of the suggestions is to upgrade to iMovie 9 and this may solve the problem. However, another solution is to convert the AVCHD Lite videos to the native iMovie format .dv or .mov format with Panasonic AVCHD Lite converter. Aunsoft MTS/M2TS Converter for Mac is the recommended Mac Panasonic AVCHD Lite converter to transcode HD video MTS to DV and MOV with perfect video and audio synchronization. 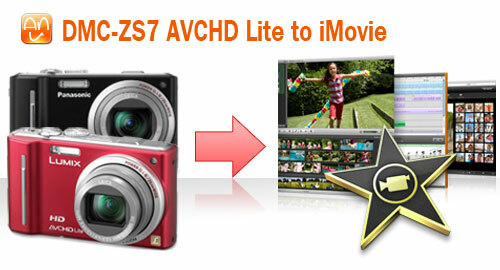 Below is the fast conversion from AVCHD Lite to iMovie on Mac Snow Leopard. Step 1. Load Panasonic AVCHD Lite videos to Aunsoft MTS/M2TS Converter for Mac. Connect Lumix DMC-ZS7 to MacBook Pro with USB cable, and transfer .mts files from camcorder to Apple hard drive. Run Aunsoft MTS/M2TS Converter for Mac as the perfect Mac Panasonic AVCHD Lite converter, and click the "Add" button to load .mts videos for conversion. To get native Apple iMovie DV format, just click the "Format" option, and choose DV Video > Apple DV NTSC(*.dv) or Apple DV PAL(*.dv) according to your location. To get iMovie MOV format, just just click the "Format" option, and choose Adobe Premiere/Sony Vegas > MOV (AVC)(*.mov) for converting AVCHD Lite MTS to 720p MOV. Step 3. Convert AVCHD Lite to iMovie format. Click the convert button under the preview window, and the conversion from MTS to DV/MOV for iMovie will start immediately. The Mac Panasonic AVCHD Lite converter include advanced technology to keep the video and audio in synchronization, and the output videos from the conversion will work smoothly in iMovie. If you have other AVCHD Lite cameras like Panasonic DMC-ZS3, or other AVCHD camcorders like Panasonic HDC-TM700, Sony HDR-CX550, Canon HF S200, you can also use the Mac Panasonic AVCHD converter to bring HD videos to iMovie, Final Cut Pro, FCE or Adobe Premiere Pro on Mac OS X. How to Burn AVCHD MTS/M2TS to DVD with iDVD on Mac OS X? How to Use Aunsoft MTS/M2TS Converter for Mac?